Have you ever thought just how amazing the humble hinge is? What an incredible bit of technology: without it the doors and windows in your house wouldn’t open, your fridge wouldn’t shut, and the lid on your kettle wouldn’t helpfully pop up and press back down again. Historically, hinges like many technological innovations were expensive to produce and so were coveted by the ruling classes and religious and political elite. Beautifully decorated hinges both big and small were used to display wealth and symbolise power on castle drawbridges and jewellery clasps alike. Hinges used in military applications such as in trebuchets and crossbows proved advantageous and helped the technology spread throughout the Middle Ages. The industrial revolution delivered a sea change in the manufacturing process for hinges, making them cheaper and easier to produce. At the same time demand exploded as machines took centre stage and needed hinged components to function. New innovations such as the use of ball bearings for smoother opening meant the hinge was now truly mainstream. 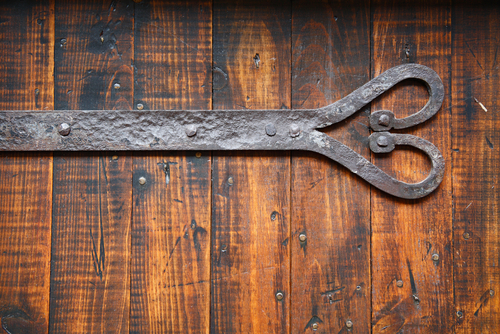 Hinges are still a fundamental component in our homes and at The Rustic Merchant we provide a wide selection of traditional and vintage wrought iron hinges suitable for many different applications. The appeal of large, decorative strap hinges harks back to their usage on eminent buildings such as churches and castles and they are a striking addition to doors and gates in and around your home. We also supply dummy hinge fronts which can be used on the front of a door to give the look of vintage cast iron hinges without needing to replace the entire hinge itself.